The greenbug, Schizaphis graminum, is a serious pest of sorghum (Sorghum bicolor). For the past several decades, resistant sorghum hybrids have been used to control greenbug populations. However, the durability of plant resistance is frequently challenged by evolution of new greenbug biotypes, and there is a continuous need for screening of resistant germplasm for its effective management in the field. Natural variation in sorghum plants/populations provides distinct approaches to identify novel sources of resistance against greenbugs. In this study, we used the recently developed sorghum nested association mapping (NAM) population parental lines to understand sources of sorghum resistance to greenbugs. Using choice and no-choice assays, we have identified SC265 and Segaolane as the resistant and susceptible lines, respectively, to greenbugs compared to the wild-type plants. The Electrical Penetration Graph (EPG) analysis revealed that the greenbugs spent significantly lesser time in the xylem and sieve element phases while feeding on the resistant NAM parental line, SC265, compared to the susceptible (Segaolane) and wild-type (RTx430) sorghum lines. In addition, the EPG results indicated that there is no significant difference in the time to first probe, time to reach first sieve element, pathway phase, and non-probing phase among the three sorghum plants, which suggests that the resistance factors present in the vascular tissues of the resistant line (SC265) potentially contribute to the resistance mechanisms against greenbugs. Overall, SC265 NAM parental line showed a combination of antixenotic and antibiotic-mediated resistance mechanisms against greenbugs, whereas the susceptible line Segaolane displayed the least resistance to greenbugs. The online version of this article ( https://doi.org/10.1007/s11829-019-09679-y) contains supplementary material, which is available to authorized users. Sorghum [Sorghum bicolor (L.) Moench (Poaceae)] is one of the world’s most important monocot crops grown for food, feed, fooder, and/or fuel (Taylor et al. 2006). More recently, sorghum has garnered more attention as a food crop in Western countries due to its high nutrient content (de Morais Cardoso et al. 2017). In addition, sorghum is rich in bioactive phenolic compounds, which have beneficial effects on gut microbiota and on the pharmacology of diseases such as inflammation, dyslipidemia, cancer, and hypertension (de Morais Cardoso et al. 2017). Moreover, dryland agriculture is gaining momentum with crops such as sorghum due to the increased scarcity of water availability for irrigation (Li et al. 2008). However, sorghum is also susceptible to numerous insect pests that can result in economic yield losses (Reddy 1988; Reddy et al. 2017; Sharma et al. 2017). The greenbug, Schizaphis graminum Rondani (Hemiptera: Aphididae), is one of the key pests of sorghum and various other cultivated grasses (Morgham et al. 1994; Flinn et al. 2001; Royer et al. 2015). This species is found in the temperate parts of the world and across all states of the U.S. (Harvey et al. 1997; Burd and Porter 2006; Aljaryian and Kumar 2016). Greenbugs develop in the whorls of young seedling plants and predominantly colonize on the abaxial surface (lower side) of leaf. 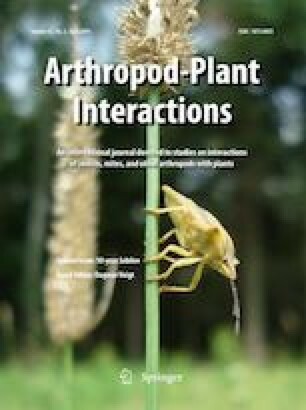 Similar to other aphids, greenbugs also ingest the sap from the phloem by inserting their stylets and sucking, while creating stylet sheaths and injecting toxic saliva into plants which cause leaf discoloration and kill plant tissues (Ma et al. 1990). Besides causing direct feeding damage, greenbugs also transmit viral diseases such as maize dwarf mosaic virus and sugarcane mosaic virus (Berger et al. 1987; Gray et al. 2002). The development of new greenbug biotypes adds additional complexity in controlling these aphids in field crops. More than 10 biotypes of greenbugs have been reported thus far, and among them there are highly damaging, such as the biotypes C, E, I, and K (Harvey and Hackerott 1969; Harvey et al. 1991, 1997). Since the continued reliance on insecticides has led to the increased greenbug resistance to pesticides (Teetes et al. 1995; Peters et al. 1975; Sloderbeck et al. 1991; Zhu et al. 2000; Gao and Zhu 2002), host plant resistance is considered to be one of the most promising, safe, and sustainable pest management strategies, if used appropriately (Sharma and Ortiz 2002; Stout 2014; Koch et al. 2016). Among the different categories of resistance, antixenosis and antibiosis constitute the major mechanisms of plant resistance to aphids (Painter 1951; Kogan and Ortman 1978). Antibiosis has a detrimental physiological effect on the insect biology after feeding on the host plant (Painter 1951), whereas antixenosis negatively affects the insect behavior (mainly) by structural impact (Kogan and Ortman 1978). Plants synthesize a multitude of secondary metabolites that could have an antibiotic effect on aphids. Some of these metabolites can also act as insect-deterrent compounds, which can effectively deter the aphids from sustained sieve element feeding (Louis and Shah 2013; Nalam et al. 2018b). Aphids use their slender stylets present in the piercing–sucking mouthparts to feed on phloem sap by piercing plant tissue and extracting plant fluids. The aphid stylet penetration activities are generally considered as cues to accept/reject the plant (Powell et al. 2006). The Electrical penetration graph (EPG) technique has been successfully utilized to investigate the specifics of plant resistance to piercing–sucking insects (Tjallingii 1985). Monitoring this aphid probing behavior is critical to understand the localization of plant resistance and determine how plants engage their resistance components to restrict aphid feeding (Louis et al. 2012b; Nalam et al. 2018a). The direct current (DC)-EPG system records the electrical resistance fluctuations produced by the penetrating insect and the electromotive force (EMF) signal components that are generated as a result of the aphid feeding (Tjallingii 1985). This responsiveness to EMF components is utilized to differentiate between intracellular and intercellular aphid stylet tip positions. The obtained waveform pattern varies with the change of position of aphid stylets within plant tissues. For example, when the aphid stylet is inserted intercellularly, the voltage is positive and when inserted intracellularly, the voltage is negative (Tjallingii 2006), resulting in potential drops in the signal that correlate with the physiological condition and defense status of the host. Broadly, the EPG waveforms are categorized into four phases: pathway phase, xylem phase, sieve element phase, and non-probing phase. The pathway phase represents time spent by aphids in various activities such as insertion and withdrawal of stylets intercellularly and brief sampling of cells that happens intracellularly (Jiang and Walker 2001). The xylem and phloem phases represent ingestion of water and phloem sap, respectively (Tjallingii 2006). The non-probing phase represents periods of no stylet movement. Natural variation in crop plant populations is an excellent source for plant resistance to pests and pathogens (Gur and Zamir 2004; Meihls et al. 2013). Recently, a nested association mapping (NAM) panel consisting of 10 recombinant inbred line populations has been developed in sorghum for the dissection of complex traits (Bouchet et al. 2017). These ten NAM founder lines were selected to capture a substantial proportion of the global genetic diversity of sorghum inbred lines (Bouchet et al. 2017). In addition, a NAM population of 2214 recombinant inbred lines was generated by crossing a genetically diverse population of ten sorghum inbred lines to an elite reference line RTx430. 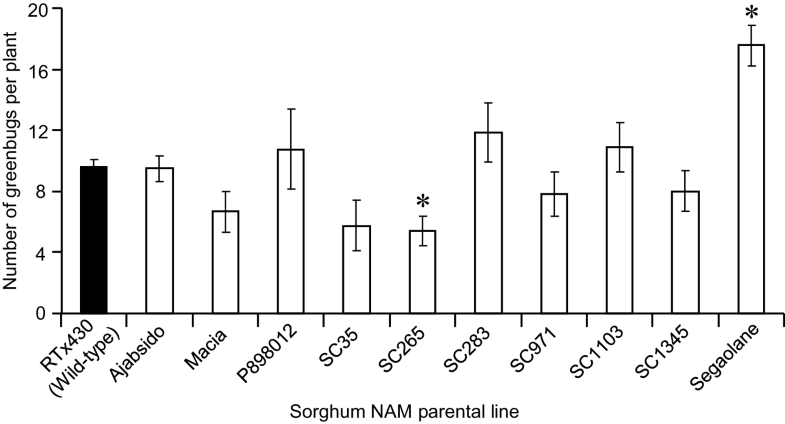 Thus, the sorghum NAM population has a natural diversity of sorghum germplasm, and to date, the sorghum NAM lines have not been used to examine the novel sources of resistance to insect pests and it is possible that these lines could act as a rich genetic resource to elucidate the underlying genetic basis of sorghum resistance to greenbugs. In this study, we utilized the founder sorghum NAM lines to elucidate the sources of sorghum resistance or susceptibility to greenbugs. The main objective of our study was to identify the most resistant and susceptible NAM founder lines against greenbugs using choice (antixenosis) and no-choice, developmental (antibiosis) assays, as well as the EPG technique to assess the feeding behavior of greenbugs on these lines. Ten founder lines of sorghum NAM populations were obtained from USDA-GRIN global germplasm (USA), which were Ajabsido, Macia, P898012, SC35, SC265, SC283, SC971, SC1103, SC1345, and Segaolane. Sorghum genotypes, including the ‘BCK60’ genotype for insect rearing, were grown in Cone-Tainers (Ray Leach SC10; Stuewe & Sons, Inc., Tangent, OR) filled with soil mixed with vermiculite and perlite (PRO-MIX BX BIOFUNGICIDE + MYCORRHIZAE, Premier Tech Horticulture Ltd., Canada) in the greenhouse with a 14-h-light/10-h-dark photoperiod, 25 °C, and 50–60% relative humidity at the University of Nebraska-Lincoln (UNL), USA. Two-week-old plants at the three-leaf stage (Vanderlip and Reeves 1972) were used for all the experiments. Greenbugs (biotype I) colony was obtained from Dr. John D. Burd, USDA-ARS in Stillwater, Oklahoma, USA (Burd and Porter 2006). This colony was maintained on susceptible sorghum genotype ‘BCK60’ in a growth chamber with a 14-h-light/10-h-dark photoperiod, 140 µE m−2 s−1 light quality, 23 °C, and 50–60% relative humidity. New plants were replaced with old, degenerated plants in growth chamber, whenever needed. Both no-choice and choice assays were performed with greenbugs against ten NAM parent lines. The experimental design for both assays was Completely Randomized Design (CRD), i.e., all plants were randomly arranged and infested with aphids. For no-choice assay, ten adult apterous aphids of similar age and condition were released on each plant and covered with tubular clear plastic cages ventilated with organdy fabric on the top of the cage. Total number of aphids, including both adults and nymphs were counted after 7 days of release on each plant. For choice assay, ten NAM parent lines, along with the control line RTx430 were grown per pot (10 inches diameter by 9 inches height) at equal distance (~ 5.0 cm). After 2 weeks of planting, when the sorghum genotypes reached the three-leaf stage (Vanderlip and Reeves 1972), 100 adult apterous aphids of similar age and condition were introduced at the center of pot on a filter paper placed on the soil substrate so that the aphids have equal access to all the genotypes and also allowed the aphids to freely move on all plants. Settled aphids on each plant were counted after 24 h of release. For no-choice and choice assays, we had 12 replications per treatment (no choice: 12 pots including one plant per pot, choice: 12 pots including 11 plants per pot) and the assays were replicated three times independently (no choice: 3 × 12 pots including one plant per pot, choice 3 × 12 pots including 11 plants per pot). Sorghum genotypes identified from no-choice assay as the most resistant (SC265) and susceptible (Segaolane) lines, along with control, RTx430, were used for EPG monitoring to assess the feeding behavior of greenbugs. Two-week-old potted plants at the three-leaf stage were used for the EPG experiments. Adult apterous greenbugs were separately placed on these plants at the middle of the adaxial leaf lamina. The aphid wiring and experimental procedure were carried out as described previously (Nalam et al. 2018a). Briefly, a gold wire attached to copper electrode was glued to dorsum of aphids using silver conductive glue. The silver conductive glue was prepared by mixing 4 ml water with a single drop of Triton X-100, 4 g water-soluble glue (Scotch clear paper glue, non-toxic; 3 M, St. Paul, MN, USA), and 4 g silver flake (99.95%, size, 8–10 µm, Inframat Advanced Materials, Manchester, CT, USA). Another copper electrode was inserted into the soil surrounding the potted plant. A Giga-8 EPG model (EPG Systems, Wageningen, The Netherlands) with a 109 Ω resistance amplifier was connected to both plant and insect electrodes and an adjustable plant voltage were used for assessing feeding behavior of greenbugs on sorghum genotypes. The EPG experiments were conducted at laboratory conditions at 22–24 °C and 40–45% RH under continuous light conditions. Adult apterous greenbugs were starved in an empty plastic petri dish for 1 h prior to the start of EPG recording. Recordings were made on eight plants (mix of three selected genotypes) at a time, which were placed randomly in a Faraday’s cage. All EPG recordings were started between 11 AM–12 noon local time (U.S. Central Standard Time). We had 15 replications per plant genotype (NAM lines and control) of recordings for 8 h. Previously, it was shown that 8-h duration of recording is sufficient to quantify the different feeding activities on host plants and the different waveform patterns selected in this study are the aphid feeding behavior parameters that are correlated with host plant resistance (Pegadaraju et al. 2007; Louis et al. 2010, 2012a; Varsani et al. 2019). EPG acquisition software (Stylet+, EPG Systems, Wageningen, The Netherlands) was used to record waveforms of greenbugs feeding on sorghum plants. 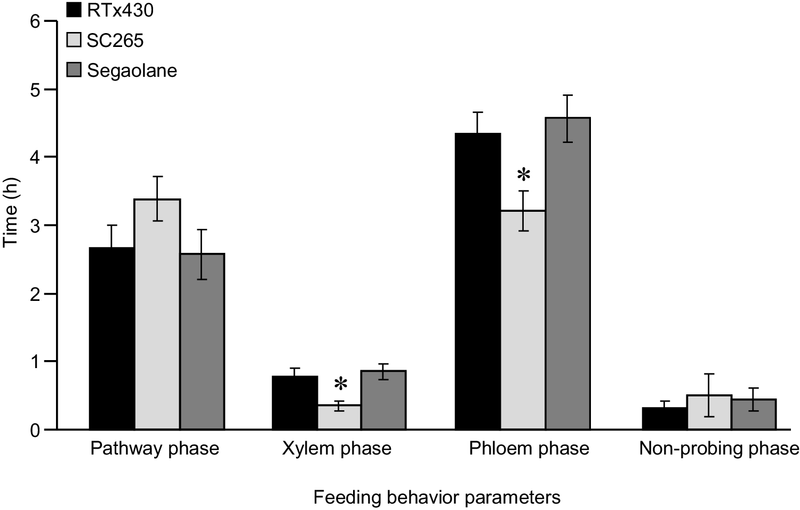 Several feeding behavior parameters, following a successive series of A to F, have been considered in this study. The duration of pathway phase (A, B, C, and F), xylem phase (G), sieve element phase (E), and non-probing phases were recorded and calculated. 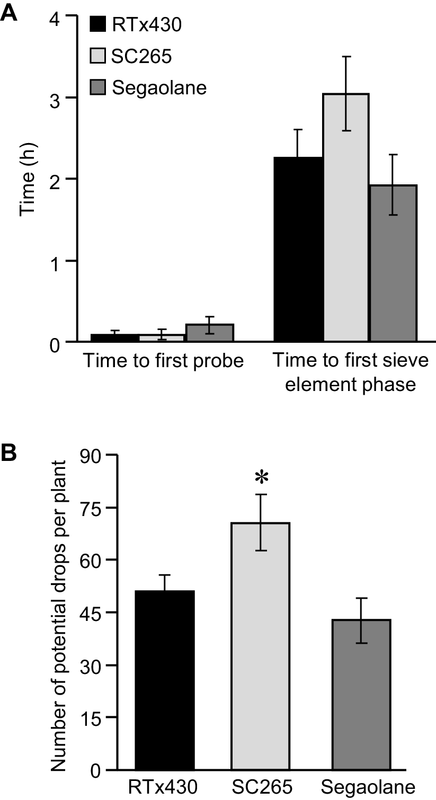 The other parameters include time to first probe by aphid (time difference between starting of recording and first insertion of stylet into plant), time to first sieve element phase (time difference between starting of recording and initiation of sieve element phase), and number of potential drops during 8-h recording of waveforms were calculated. E1 and E2 show aphid salivation and passive ingestion of phloem sap, respectively, which were together considered as sieve element phase (E). Waveform characteristics, F, indicate derailment of aphid stylets showing penetration difficulties, which was not found during our waveform recordings. EPG analysis software (Stylet+, EPG Systems, Wageningen, The Netherlands) was used to analyze the waveforms of greenbugs feeding on sorghum plants. The no-choice and choice data were analyzed as a completely randomized design using a generalized linear mixed models (GLMM) for count data and the GLIMMIX procedure (Stroup et al. 2018), which fits statistical models to data with correlations or non-constant variability and where the response is not necessarily normally distributed (PROC GLIMMIX, SAS 9.3, SAS Institute). Negative binomial distribution was used to analyze the count data. The explanatory and response variables were sorghum genotypes and number of aphids counted on each plant after day 7, respectively. Multiple comparisons were computed using Dunnett’s adjustment, comparing the number of aphids per NAM parental lines vs the number of aphids on the control plant (Supp. Table 4). For EPG experiments, non-parametric Kruskal–Wallis test was used to compare the duration of six different feeding parameters/phases among three different sorghum lines (RTx430, SC265, Segaolane) using PROC NPAR1WAY procedure, considering the non-normally distributed data. Multiple comparisons between means of different treatments were carried out using SAS macro implementation of the Nemenyi and Dunn’s tests (Elliott and Hynan 2011). Greenbug survival and reproduction were low on the inbred line SC265, intermediate on RTx430, and high on Segaolane (F = 10.01; df = 10, 121; P < 0.0001; Fig. 1), 7 days post aphid infestation. We did not observe any significant differences in the number of aphids per plant on other sorghum NAM parental lines. Supp. Table 1 shows the mean number of greenbugs on different sorghum NAM parental lines and the wild-type RTx430. We also performed antixenosis test with the same sorghum parental NAM lines by introducing adult apterous greenbugs at the center of the pot. The number of adult greenbugs that had settled on Segaolane plants were significantly higher, whereas SC265 plants had significantly fewer adult greenbugs after 24 h compared to the wild-type control plant (RTx430) (F = 10.35; df = 10, 121; P < 0.0001; Fig. 2). Although not statistically different, SC35 plants also had fewer adult greenbugs after 24 h compared to the wild-type control plant (RTx430) (P = 0.06). Supp. Table 2 shows the mean number of adult greenbugs and percentage of adult greenbugs that had settled on different sorghum NAM parental lines and the wild-type RTx430. 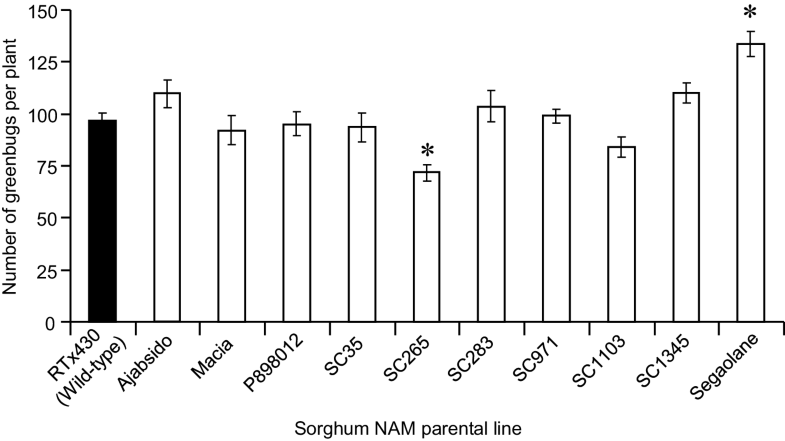 For the EPG studies, we used the two sorghum NAM parental lines SC265 and Segaolane, which have shown the greatest variation of resistance to greenbugs (Figs. 1, 2). RTx430 was used as the respective control. EPG waveform recordings were categorized into four different phases: pathway phase, xylem phase, sieve element phase, and non-probing phase. Representative EPG waveforms produced by greenbugs feeding on the sorghum NAM parental lines SC265 and Segaolane, and the RTx430 are shown in Fig. 3. Our results indicate that the greenbugs spent a significantly shorter time in the sieve element phase of the resistant SC265 line, compared to Segaolane and RTx430 lines (df = 2; P = 0.0219; Fig. 4). Similarly, greenbugs spent significantly less time in the xylem phase of SC265 compared to RTx430 and Segaolane lines (df = 2; P = 0.0022; Fig. 4). There was no significant difference in the duration of non-probing phase among all the three sorghum lines (df = 2; P = 0.81; Fig. 4). 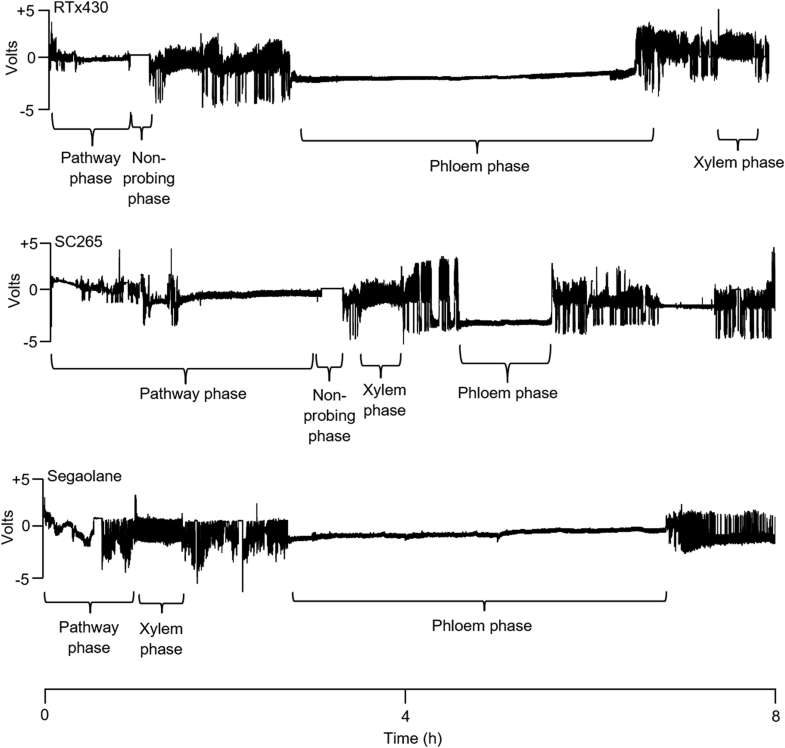 Furthermore, although not significantly different, we observed a longer duration of pathway phase in the SC265 plants compared to RTx430 and Segaolane lines (df = 2; P = 0.2872; Fig. 4). Our results also indicate that the greenbugs spent comparable amounts of time for the time to first probe and time to reach first sieve element phase among all the three sorghum lines (df = 2; P = 0.4285 df = 2; P = 0.1957, respectively; Fig. 5a). However, the total number of potential drops produced by greenbugs on SC265 were significantly higher than the other two sorghum plants, RTx430 and Segaolane (df = 2; P = 0.0088; Fig. 5b). Supp. Table 3 shows the mean time spent by greenbugs for various feeding activities on different sorghum NAM lines and the wild-type RTx430. Here, we provide evidence that the sorghum NAM founder line SC265 demonstrates both antibiosis- and antixenosis-mediated resistance to greenbugs, and it also deters greenbugs from sustained sieve element feeding. Our no-choice assay indicates varied levels of resistance to greenbugs in ten founder lines of the sorghum NAM population compared to RTx430, the common parent used for these NAM lines (Fig. 1). Furthermore, in the choice assay, there were significantly altered numbers of adult greenbugs settled on few sorghum lines compared to the control plant (RTx430) (Fig. 2). Several previous studies have shown that the reduced phloem sap ingestion from the host plants correlates with the enhanced resistance to aphids. For example, soybean aphids (Aphis glycines Matsumura; Hemiptera: Aphididae) fed significantly less from the sieve elements of soybean cultivars that exhibit antibiosis (Diaz-Montano et al. 2007; Zhu et al. 2011). Similar results have been shown in other plant–hemipteran systems, such as green peach aphid (Myzus persicae Sulzer; Hemiptera: Aphididae) feeding on Arabidopsis thaliana L. (Heynh.) (Brassicaceae) and Capsicum baccatum L. (Solanaceae), greenbugs on switchgrass [Panicum virgatum L. (Poaceae)], and Asian citrus psyllid Diaphorina citri Kuwayama (Hemiptera: Liviidae) on citrus (Pegadaraju et al. 2007; Koch et al. 2015; George et al. 2017; George and Lapointe 2018; Sun et al. 2018). Besides the chemical substances present in the phloem sap of resistant plants, it is possible that the presence of morphological/physical barriers on host plants can also contribute to difficulties in stylet penetration and sustainment for sap-sucking insect feeding (Baldin et al. 2017; George et al. 2017). Such strong antixenosis, in some cases, can lead to starvation and death of the insects, when suitable host plants are unavailable (Smith 2005). Because our results showed that the time to first probe and the time to reach first sieve element phase were comparable for the SC265 NAM line and the other lines tested, it is highly likely that the resistance factors present in the vascular tissues contribute to the antixenotic-mediated resistance to greenbugs. Occasionally, it is difficult to differentiate between antibiosis and antixenosis (Smith 2005), and possibly the strong antibiotic factors present in the vascular tissues of SC265 NAM line may contribute to antixenotic-mediated resistance, which deter the aphids from settling on the host and feeding continuously from the phloem sap. The sorghum NAM parental line, Segaolane, which was highly susceptible to greenbugs in both the choice and no-choice assays compared to the wild-type and resistant sorghum lines, was also found to be susceptible against the sugarcane aphid, Melanaphis sacchari Zehntner (Hemiptera: Aphididae) (Teetes et al. 1995), a serious pest of sorghum in the U.S. since 2013 (Armstrong et al. 2015). This result suggests that the Segaolane might produce susceptibility factors that function in facilitating aphid colonization across aphid species. For example, it was shown that compounds derived from LIPOXYGENASE 5 (LOX5) that encodes a 9-lipoxygenase promoted enhanced aphid fecundity on Arabidopsis (Nalam et al. 2012, 2018b). In addition, green peach aphid feeding on potato plants (Solanum tuberosum L.; Solanaceae) have demonstrated an enhanced accumulation of 9-LOX products (Gosset et al. 2009), which may also contribute to aphid susceptibility in potato. Although the exact compounds/metabolites that contribute to susceptibility in Segaolane are not known, it is highly plausible that phloem sap-sucking insects encounter these factors that aid their colonization of sorghum plants. Our EPG study indicates that the resistance factors present in the SC265 lines may be phloem-localized. However, we observed a significantly higher number of potential drops in the resistant sorghum SC265 line, which corresponds to an increase intracellular punctures by aphid stylets. Increased potential drops have been found to be correlated with plant resistance in several other plant–aphid interactions. For example, pea aphids (Acyrthosiphon pisum Harris; Hemiptera: Aphididae) when fed on a resistant legume variety had significantly higher number of potential drops compared to the pea aphids that were fed on a susceptible legume variety (Gao et al. 2008). Similarly, soybean aphids feeding on soybean genotypes that exhibit antibiosis and antixenosis had significantly higher number of potential drops compared to the soybean aphid-tolerant and susceptible genotypes (Baldin et al. 2018). Taken together, these studies suggest that the brief sampling of cells by aphid stylets eventually lead to host plant acceptance or rejection, and the higher number of potential drops has been correlated with enhanced resistance to aphids (Tjallingii 2006; Chandran et al. 2013; Baldwin et al. 2018). In addition to antibiosis and antixenosis, tolerance has been identified as a category of resistance to control insect pests (Painter 1951; Smith 2005). Unlike antibiosis and antixenosis, tolerance is a plant characteristic, which does not interfere with insect pest’s biology or behavior (Painter 1951; Smith 2005; Koch et al. 2016). Tolerance aids the plant to recover or withstand from the insect damage through growth and compensatory physiological processes (Koch et al. 2016). Although not characterized in this study, it would be intriguing to screen sorghum NAM parental lines that exhibit tolerance traits to greenbugs. In summary, this study provided the foundation to further explore the role of key genes, signaling networks, defense pathways, and/or regulatory mechanisms that underlie sorghum resistance to greenbugs. In addition, the information presented in this study potentially contribute to the sorghum breeding programs that are aimed at developing novel pest management strategies and increasing the level and durability of resistance in sorghum against phloem sap-sucking insects. We thank Dr. Kyle Koch (University of Nebraska-Lincoln, USA) for providing the greenbug colony. Braden Wojahn was supported by Undergraduate Creative Activities and Research Experience (UCARE) funds from the University of Nebraska-Lincoln, USA. This work was partially supported by the Nebraska Agricultural Experiment Station with funding from the Hatch Act (Accession # 1007272) through the USDA National Institute of Food and Agriculture to Joe Louis and funds from USDA-ARS (58-3042-6-070).